Commodity traders are in the midst of the worst market downturn on record and as a result the dry bulk sector is experiencing one of the worst times it has seen in recent years. The Baltic Dry Index is unpredictable, and as of June 2016 is hovering around the 600 mark, down nearly 95% from its peak in 2008, with too many ships to transport the limited supply of cargoes currently being produced. Throughout these continued and developing issues, financing for shipping is being cut back by banks and traditional institutions. As a result of this, the number of ships that are old and now redundant and heading to the hands of recycling providers is steadily growing, highlighting the need for this vital part of the industry. In the first quarter of 2016, dry bulk scrapping witnessed a spree of demolition stemming from the collapse of freight rates. According to estimates, 2.5 million to 14.5 million dwt was scrapped in Q1, around 145 to 180 vessels. This was a rise of 15–23% based on the number of vessels, and 42–57% on volume year-on-year, with nearly 80% of the vessels dismantled in Alang ship recycling yards in India being bulk carrier, container and general cargo ships. Ship recycling plays an indispensable role in the lifecycle of a ship, and it is fundamental to the successful commercial and sustainable progression of the industry. Following a succession of newbuildings being delivered after the boom of 2012, charterers have their pick of newer, more economically viable and efficient vessels. This is causing older, more inefficient vessels to become redundant, leading to the need to scrap them. This is a theme throughout the industry, not just in the dry bulk sector. However, in the dry bulk sector in particular there is now a trend for younger vessels to be scrapped, with vessels as young as seven years old being recycled. This just highlights the current market complexities, and the pressure that is on shipowners and charterers to survive in this volatile and unpredictable market. EU’s Ship Recycling Regulation mean that the need for companies who specialize in recycling to adhere to the upmost highest standards of sustainability and safety is more scrutinized than ever before. GMS, as the world’s largest cash buyer of ships and offshore assets for recycling, is committed to leading Corporate Social Responsibility (CSR) and pioneering sustainability within the ship and maritime recycling field. Even though the general cargo, bulk carrier and container ships are all dismantled in Alang, they generate smaller quantities of waste for landfill compared to passenger, tanker and reefer ships. The structural complexity of these vessels is minimal compared to other types of ships. The yards are able to make all the blocks fall inside the vessel (except forepeak and stern) during the recycling process, thus, these vessels are truly recycled in a safe and environmentally friendly manner with near zero pollution to environment. This makes dry cargo vessels the first choice of vessels to be recycled at yards, with on average only 2–2.5% of the vessel not able to be recycled. In addition, GMS has in-house Green Recycling Specialists that operate closely with yards to help them work towards meeting the standards of the Hong Kong International Convention for the Safe and Environmentally Sound Recycling of Ships (HKC) and its guidelines. They also liaise closely on yard- side issues with the Ship Recycling Industries Association, Gujarat Maritime Board, the Ministry of Shipping and local organizations and governmental institutions. GMS’s ‘Green Team’; includes some of the most respected names in the world in their respective areas. This includes, Dr. Nikos Mikelis, Non- Executive director at GMS overseeing our Green Recycling program, who is widely considered the ‘Father’ of the HKC from his work at the International Maritime Organization (IMO). Although it is yet to enter into force, the HKC sets achievable, sustainable goals for ship recycling and is already making headway towards changing the industry. Shubh Arya Steel recently became the fifth certified HKC-compliant yard in Alang, verified by RINA. The yards are beginning to realize that previous practices are no longer socially or environmentally acceptable, or economically viable. It is also becoming clearer that it is in the commercial interest of yards to become compliant with global standards and embrace sustainability, to ensure that shipping companies can recycle vessels at their facilities without fear of industry or public backlash. Class Society certification programmes demonstrate that this progress is achievable and that it will be rewarded. They show what can, and must, be achieved in all yards and the benefits of reaching those goals. There are 20 yards currently going through the HKC Statements of Compliance (SOC) process, which will be certified by RINA and ClassNK and their success has forced other, non-compliant yards to consider HKC compliance and ISO and OSHSAS certification to boost their businesses. The progress of these yards, and the importance of increasing standards have recently been highlighted by Maersk. Its choice to recycle vessels in Alang is a consequence of the hard work and financial investment which has been undertaken at yards in the area. With support from Maersk and other ship owners the progress can continue in earnest. By initiating recycling of their vessels the Maersk Georgia and the Maersk Wyoming at Alang's Shree Ram ship recycling facility, the company is aiming to ensure further development of financially feasible and responsible recycling options to the benefit of Alang and the shipping industry. Maersk is planning an additional long-term investment of capital and human resources to ensure that they are able to sustainably scrap their vessels in compliance with the HKC as well as international standards on labour conditions and anti-corruption. GMS has partnerships with leading HKC-certified yards in South East Asia, and are seeing first-hand the significant growth and demand for the green recycling service. This is demonstrating that the compliant yards are reaping the commercial benefits from their continued efforts. This is the case across the industry, not just for South East Asia, and this globally recognized standard must be supported and given the chance to achieve its potential, and change yards around the world for the better. Many people rely on this vital industry, both directly and indirectly. Recycling is something that all ships will one day face and the stigma attached to it needs to be challenged in the face of vast and ongoing improvements. The focus needs to be on the positive changes and progress being made thanks to the HKC, and those that are driving it forward in the major recycling regions. 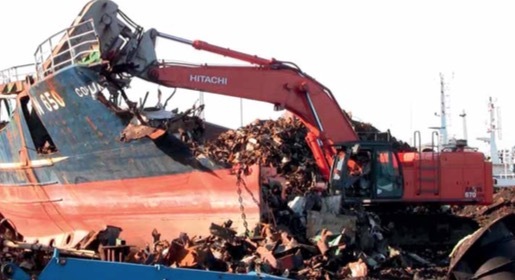 Incoming EU Ship Recycling Regulations will see European- flagged vessels only be permitted to be recycled at yards reviewed, accepted and published to the approved European List of Ship Recycling Facilities. Shipowners should be very concerned that recent developments appear to reinforce the idea that, when implemented, it will be interpreted as a total ban on beach recycling for European flagged vessels. If imposed in this way, the legislation will set the global recycling industry on a knife-edge and threaten a reversal of the sustainable progress set in motion by the HKC. A ban on beaching will create precisely the false dichotomy that the EC say they are working to solve; poor conditions on beaches and higher standards elsewhere. This would certainly not be in line with the IMO’s high goals of raising standards at all yards across the world. More than two-thirds of the world’s ship recycling is conducted on beaches in South East Asia. Improving the working conditions and environmental impact of these yards to comply with the HKC is essential. The industry as a whole needs to support the compliant yards, those working towards compliance, and the HKC itself, to help foster this continued improvement. That means that shipowners need to take advantage of sustainable recycling services and make sustainable recycling the norm across the industry, rather than the exception.